This article will break down 13 specific strategies we've used (or seen used) to great effect to grow business online. Lead generation, lead nurturing, site optimization, it's all here and more. To download this article as a PDF for future reference, click here. Click popups have, in many ways, replaced much of the need for squeeze pages. Every time you would currently create an opt-in web page devoted to a single conversion goal (email-gated content, webinar, conference, blog subscription, etc), use a click popup instead. And here’s the results from 14 of Wishpond’s click popups (prompting users to provide their email address to download a content upgrade) vs 14 of Wishpond’s landing pages (prompting users to provide their email address to download an ebook). I’m happiest when growth isn’t dependent on a developer’s time. Strategies implementable without a coder or hours of me learning how to be one with online tutorials are A-OK in my book. This is one of those tips. In general, anything you can do to make your website simpler, more intuitive, is worth doing. I can’t tell you how many A/B tests we’ve run in an attempt to “dumb down” a visitor’s interaction with our platform. Basically when someone came to our signup page, the box for them to fill out an email address was be already selected - all they had to do was start typing. To implement this strategy within a Wishpond landing page, simply don’t change anything. “Auto-focus on first form field” is automatically enabled on our landing pages (as it’s such a consistent optimization winner). If I can implement this strategy, anybody can. This growth tip is a bit on the aggressive side, but it increased our link-conversion rates by about 400%, and numbers is numbers, people. An “oops” or “forgot-to-attach” email is a strategy within email automation designed to replicate human error. Essentially, this very effectively conceals the fact that you’re using automation at all. Firstly, send a lead-nurturing email in which you prompt recipients to check out two pieces of content (two articles, two videos, two podcasts, etc). Deliberately leave out one of the links you refer to in the email body. 1-10 minutes later, send a follow-up email which apologizes for the forgotten link and includes it. 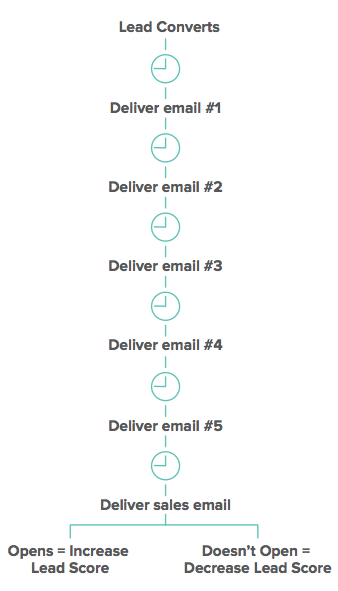 When we a/b tested this strategy (half a lead-nurturing mailout was sent with both links and half was sent with an “oops” email sent 12 minutes after the initial email), open rates and clickthrough remained about the same, but conversion on the link (registration for our free marketing academy) increased by about 400%. A content upgrade is a lead generating incentive (generally placed on an individual blog post) which provides readers with an “upgrade” to the exact content they’re reading. On the Wishpond blog we’ve used them for the past couple months to generate blog subscribers, and they’ve increased our conversion rates by about 1000%. (Source). To download a step-by-step guide to building professional-looking content upgrade for free with zero design experience, click here. Retargeting can be a fantastic strategy to recapture lost traffic or leads. More and more, your prospective customers are shopping around. They’re looking at you and your competitors with a critical eye, searching for something which makes you stand out. It could be price, quality, customer service, the look of your website or, very simply…. How often they see your brand name. Brand recognition is absolutely key in online marketing. It’s one of the most powerful psychological factors which effect us all (even though we don’t know it). Why do you think no-name brands have to charge so much less for identical products? Exactly. Because most webpages have between a 50 and 90% bounce rate, targeting every site visitor with a retargeting campaign means you’re wasting 50-90% of your ad spend. Let me repeat that, unless you implement a “hide pixel” code within your webpage, you’ll be wasting as much money as your bounce rate. I recommend about 30-45 seconds (check your Google Analytics to see your average bounce rates as well as time-on-page). Less and you run the risk of wasting ad budget; more and you run the risk of missing people who are interested, but still left relatively soon after arriving on the page. Let’s say that when you find $100, your happiness goes up 10 points. If you lose $100, your happiness should go down 10 points, right? You’d think, but you’d be wrong. People are far more impacted by loss than they are by gain. We call this “Loss Aversion” and it’s a useful thing to keep in your marketing back pocket. "10 days until you lose access to Wishpond’s lead-generating platform!" "10 days before we have to block your login details!" "10 days before the 50% discount goes away!" Sometimes, of course, growth is less about strategies or psychology and more about implementing the newest idea first. That’s where Liquid comes in. It’s actually a coding language invented by Shopify a few years ago, but it’s only recently being introduced into the rest of the marketing world. Liquid allows you to dynamically change the content of your emails depending on what you know about recipients. It’s an “if/then” language enabling you to change entire sentences or sections. This would allow me to send an email to hundreds of people but only say “Hi James” to people whose first names are James. As you might be able to guess, this is only the beginning of implementing Liquid. 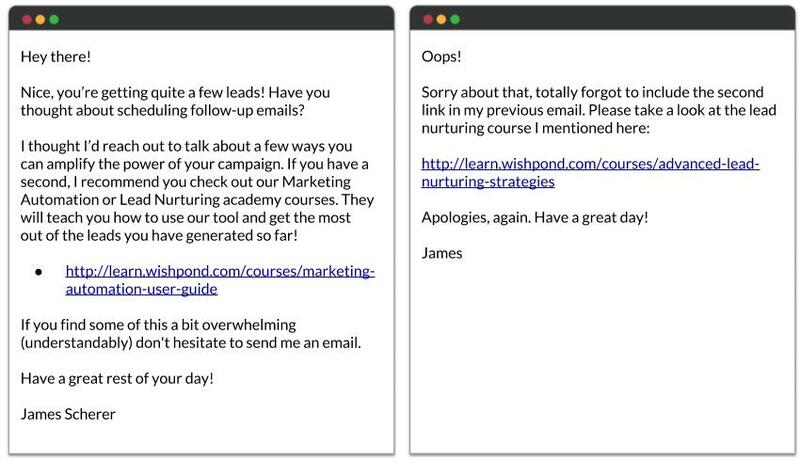 In the past couple months Wishpond has started using Liquid to personalize welcome emails, and we've seen awesome results. We switched up the emails to include a link to a course based on what each individual lead had most recently engaged with. For example, if a lead has logged in and created a sweepstakes, we automatically send them an email with a link to a course on “How to build a sweepstakes”. If they’ve created a referral promotion, we automatically send them a link to the referral promotion course. Etc, etc. This personalization improved our email click-through rates by about 76%. If you have international target markets, use Liquid to dynamically alter the text based on language. Your lead is at their hottest right after they’ve initially converted. They’ve just provided you with their email address. They’ve committed to conversion, so (if you do it right) a second conversion just feels like an extension of the first. This is why the post-signup page is such a crucial step within your sales funnel. 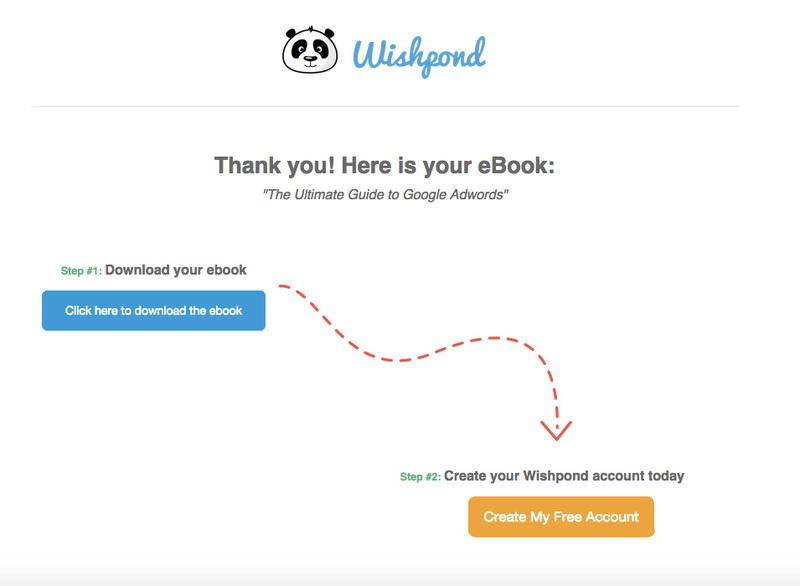 At Wishpond we use this strategy on our post sign up pages to offer a free account to anyone that downloads one of our ebooks. By phrasing our free trial offer as "step 2" of the page, it feels like the natural progression of events to first download the book and then sign up for a trial. This one’s exciting, and one of the most effective growth strategies in this article if you can get it right. We have a few ads running, one for “Facebook Sweepstakes,” one for “Facebook giveaway,” and one for “Facebook promotion.” All of these ads sends visitors to the same same landing page, but their “destination URLS” aren’t identical. These small code changes trigger corresponding code in the product landing page to change. Essentially, if the landing page sees “q=sweepstakes,” the headline will read “Facebook Sweepstakes Made Simple” or something similar. Alternatively you could just create new landing pages for each of your Google Ads (and that’s also a growth tip). There’s no point in spending money on advertising if your website isn’t prepared to receive it. And there’s no point in optimizing your website if you’re not sending traffic to it. These two marketing rules of thumb have defined the way I market for the past year or so. Alongside them, though, there’s another essential rule to keep in mind: there’s no point in getting excited about how many leads you’re generating if none of them are becoming customers. That’s where lead nurturing comes in: the act of (slowly but surely) “nurturing” your lead into a customer with educational and subtly promotional content via email. Repurpose these articles into a PDF (check out my article The Ebook Design Kit for Marketers who Can't Design for S**t for a how-to guide. Create a squeeze page to email-gate access to your PDF ebook. Create a segment of people who download the ebook - people you know are interested in the ebook’s subject within your email marketing platform or CRM. Create 6 emails: 4 built around repurposed educational content not in the ebook but still related to the subject of it, 1 built around educating but also promotion (case study, “how-to” strategy with your tools, etc), and 1 built offering a VIP demo, free trial or paid conversion. Schedule these emails to be delivered to the lead every few days (the first a few minutes after their initial conversion). Create a “catch-all” segment (usually a newsletter segment) for leads who don’t convert on your final sales email. Don’t let your leads fall through the cracks just because they weren’t ready to convert when you wanted them to. Growth Tip #11. Focus on the top and middle of the funnel equally There is no point in spending considerable time and money driving traffic to a website not optimized to receive it. Equally, there is no point in spending considerable time and money optimizing a website if nobody’s ever going to see it. The two must be done equally. We do it campaign by campaign: ensure that for every Facebook or Google Ad we create, every blog article or webinar we promote, there is a landing page ready to receive clicks and a lead-nurturing campaign beyond it ready to turn leads into sales. When I think of the term “best practice,” this is it. Testing CTA button color rarely launches your business into the Fortune 500, and your traffic isn’t big enough to get conclusive results at any speed for smaller-impact tests. When you’re a startup, you gotta act like one. Try big things to optimize for conversions or you’ll still be in your garage this time next year. Change your pricing/plans page, creating a free plan and having users upgrade to paid. Changes to your pricing/plans page, in general, are usually a big deal. Add signup to your blog. Try a large scroll popup bar. If you’re business is focused on growth, you’re not a corporate entity. Don’t pretend you are. Meet once a week to discuss optimizations. Keep the meeting under an hour and then follow-up throughout the week if necessary. Come up with good ideas, quickly. Briefly break down those which are terrible, and then implement 5 - 15 of the ones that aren’t (depending on resources and traffic). Remember, though, that unless you have significant site traffic, you’re not going to have conclusive results from any of your tests for at least a few weeks. Don’t call something conclusive just because it looks like it’s leaning one way. Wait until you’re at 95% statistical probability and then wait a few days more. Wishpond has a spreadsheet with a couple dozen growth and optimization strategies we want to test. Next to each idea are three columns: Confidence, Impact, and Ease of Implementation. We give each idea a rating from 1-10 for each of these factors and implement the ones with the greatest cumulative rating. It’s a great structure, and has done wonders for our optimization efforts. Hopefully these 13 strategies have given you a few ideas for growing your business online. If you have any questions, coding or otherwise, don’t hesitate to ask away in the comment section. I’ll be around.